Great Irish Whiskey doesn't just happen by chance, years of experience and expertise go in to creating the Jameson Black Barrel. It is the only whiskey in the Jameson stable that contains a triple distilled sweet grain whiskey which is then blended with a high proportion of select single Irish pot still whiskey. 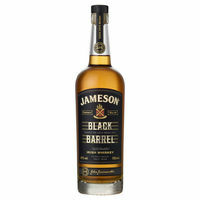 Once in the glass this exceptional whiskey shows a typical rich Jameson character and a luxurious mouth feel combining spice and exotic fruits.